Combine all ingredients except oysters in a small mixing bowl. 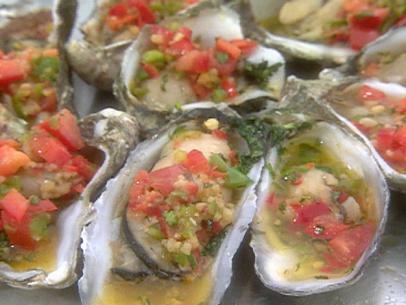 Shuck oysters and discard their top shells. Place on a preheated grill and spoon a small amount of the butter mixture onto each one. Close lid and grill for 2 minutes until the edges of the oysters just begin to curl. Transfer to a rock salt-lined platter and garnish with lemon wedges. Serve immediately.